What is Big Wes Turner’s Trio up to? Well, below is the latest near-future calendar. Note the plethora (by our humble standards) of outdoor shows. Yup, summertime means music al fresco, so get out and enjoy it while you can. 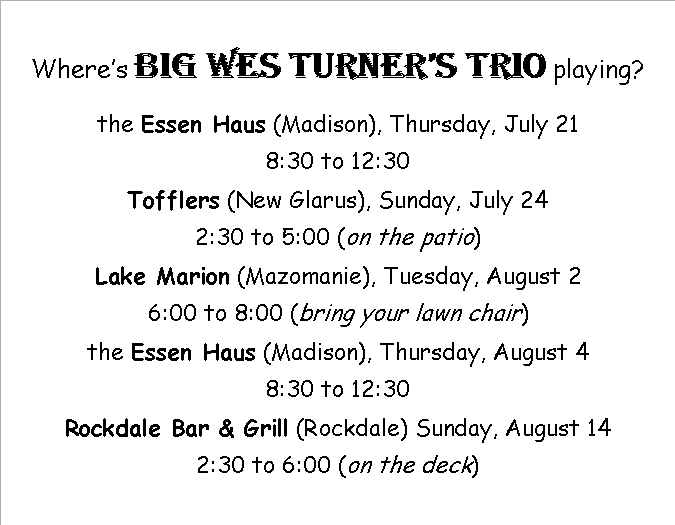 Anyone in the SW quadrant of the our fair state might consider our early-evening August 2nd concert in lovely Lake Marion Park (SE outskirts of Mazomanie—sponsored by the Mazomanie Music Conservancy). Food and beer available, but bring something to sit on. There’s ample space inside the park shelter should the weather take a turn for the worse. The aforementioned Mazomanie Music Conservancy sponsors an intimate concert on the first Fridays of the month. Check it out. 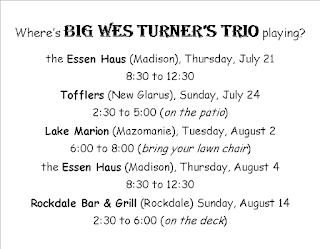 You’ll find Big Wes’s drummer and vocalist Rick Becker there holding it down for the house band. And while Rick does just that on Friday, August 5, Tom will be sitting in with The Sparks Band on the patio at Sprechers (in Middleton) from 6 to 9, playing a deep repertoire of hits and obscurities from the 60s. And, the very same evening you can find Paul Otteson and a truncated collection of his band, Faux Fawn, playing at Appleton’s big Mile of Music event (check the schedule). On Friday, August 12, harmonica-man Frankie Lee leads a laid-back trio version of The Maintainers that includes Tom and guitarslinger extraordinaire Mel Ford through several sets out on the patio at Tyranena Brewing (from 6 to 9).